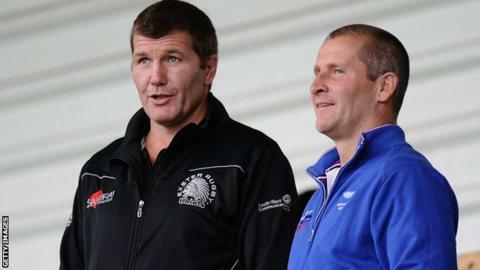 Exeter head coach Rob Baxter has backed England's stance of only selecting players from the Premiership. Toulon back-rower Steffon Armitage had been in order to be available for selection for the 2015 World Cup. "I think it's 100% correct," Baxter, who last summer, told BBC Sport. "It's a great policy to keep the best talent in this country." A number of England internationals, including Armitage and his brother Delon, and are all currently playing for clubs in the Top 14 in France. Six Nations rivals Wales, Ireland and Scotland all pick players from outside of the Pro12 competition. "I think it's a little naive to think that other competitions prepare our players better because they don't," added Baxter. "Having them based in England, being available to the England coaches readily and easily and being in the eyes of the English public is what the game should all be about. "As far as I'm concerned it's the right policy and I hope it's a policy that continues for a long time."